I missed blogging regularly while I was pregnant. Between the exhaustion of the first trimester, preparations in the second, class, and just regular activities in the third I didn't get a chance to post as much as I would have liked. So excuse the off-season post today. I realized that I never delivered on my promise to share our summer vacation eats in more detail. Our first stop on vacation was Burlington, Vermont for the Vermont Cheesemaker's Festival and other delicious eats. I did manage to post about that (Vacation Eats: Burlington, Vermont)! After our dairy extravaganza in Vermont we hit the road headed north. Just a few hours later we crossed the bridge and arrived on the island of Montreal. Did you know that it is on an island? We stayed right in the Old City. The location was perfect for squeezing in a lot in a short amount of time. Before heading to Montreal, I asked food friends for their tips on where to eat. 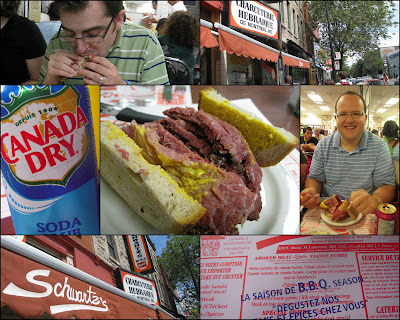 As lovers of a good deli, we knew we wanted to sample the famous Montreal smoked meat and of course the bagels. Thanks to my Canadian friends I met at Eat, Write, Retreat and other food-loving pals we had a three page list of eateries to explore. Thanks to Ethan, Kimmy, Isabelle, Olga, Emily and others who sent along tips! Our first food stop in town was Schwartz's for smoked meat. In the same location since 1928, it is a fixture in the Montreal food scene. Montreal smoked meat is brisket that has been seasoned, marinated, cured for a week (or more) and then hot smoked. Similar to corned beef or pastrami, but distinctly unique in texture and seasoning. We lined up outside the restaurant and waited for a spot for four at one of the long tables packed into the place. After a short wait, we squeezed into four cozy seats at the back of the energetic space. We ordered up sandwiches, pickles, coleslaw and some Cott's Black Cherry soda per Ethan's advice (and a Canada Dry...since we were in Canada...). The only disappointment is that they had already sold out of half-sour pickles for the day. We managed to get by with the regular kosher dills. The generous stack of smoked meat was sandwiched between thick cut rye with tangy yellow mustard. It was a perfect sandwich. We were satisfied and sufficiently stuffed for a nice walk over to the Parc du Mont-Royal. From there we walked through McGill University and down Rue St. Catherine and back to Old Montreal. I think we ended up walking about 4 miles - not bad for being four-months pregnant! The next day we decided to do our Montreal bagel taste test. After all that walking we headed out in the car for our adventure. 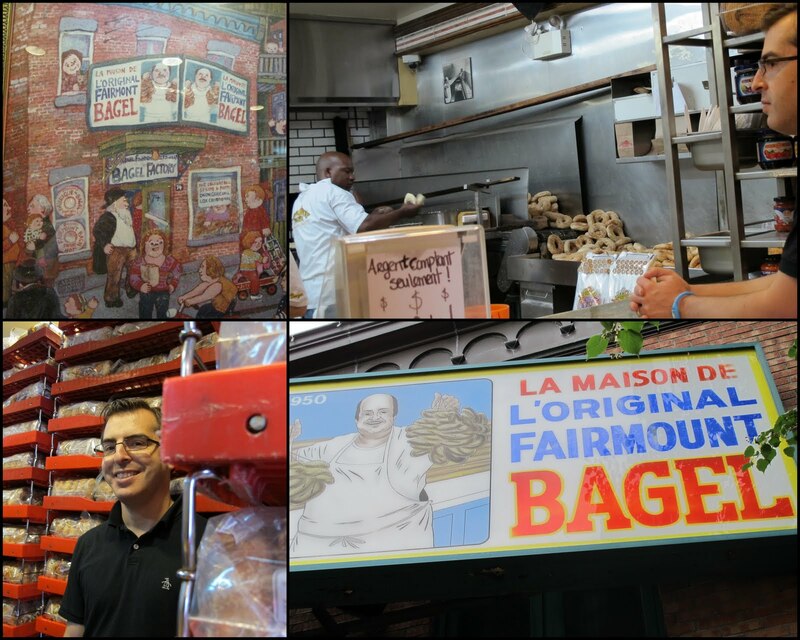 Montreal is known for bagels that are hand rolled, boiled in honey water, and cooked in a wood fired oven. This gives them the chewy texture and slightly sweet taste. The signature bagel is sesame. From my pre-trip polling I discovered that loyalties are divided when it comes to Montreal bagels. You're either a Fairmont or a St. Viateur. It was an even split between my sources. Our first stop was The Original Fairmount Bagel Bakery. Claiming to be the first bagel in Montreal (opening up shop in 1919), there were high expectations. We tucked into the small shop lined with bagels from floor to ceiling. Behind the counter bagels were being hand-rolled at a remarkable speed before the cooking process. We ordered a half dozen sesame bagels along with a bagel & cream cheese each. 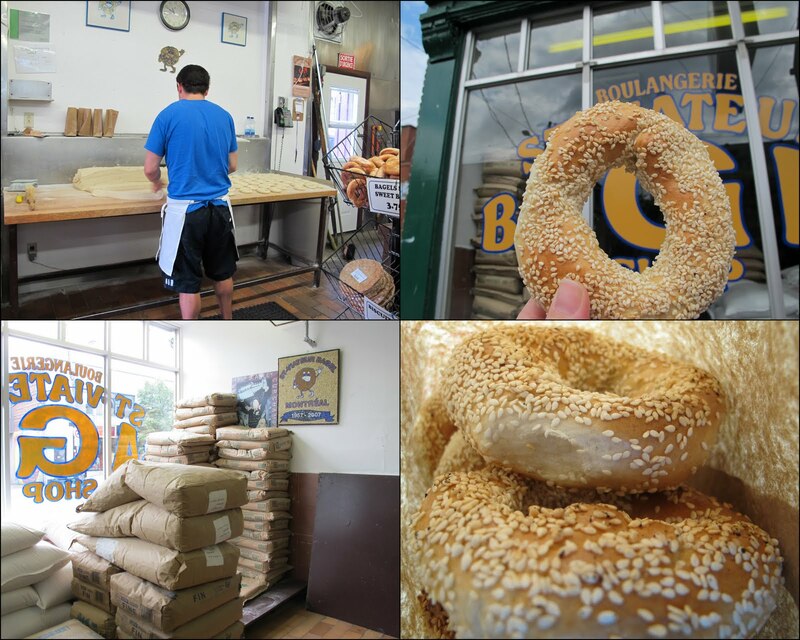 Our second stop was St-Viateur Bagel. St-Viateur opened up shop in 1957 and has been rolling out hot bagels non-stop! The shop was slightly more spacious, but still just a counter to order and take-away the goods. St-Viateur also has some bakery-cafes in other locations with seating and a more extensive menu. We were there for the bagels. The front window was lined with bags of flour waiting to be mixed, hand-rolled, boiled and baked off in a wood-fired oven. 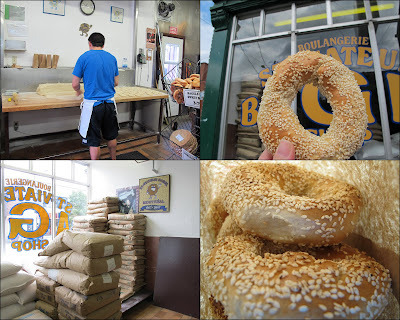 The speed of the hand rolling makes each bagel a unique shape as they are whipped together before the next step in the process. This location offered strictly bagels - packaged cream cheese was in a refrigerator case. After sampling both, we had a favorite too. Something about the texture (they give your jaw a little workout), the hint of sweetness, the toasted sesame seeds, and the wood-fired crunch made St-Viateur the winner for us. After eating the half we purchased on our first trip we made a stop on our way out of town to stock up on more! We had a fantastic trip to Montreal and look forward to going back! With such a long list of great places to eat (and see) we need a few more visits. Have you been to Montreal? Where did you eat? And are you a Fairmount or a St-Viateur? I love Montreal!!! We went to Fairmount. We went late in the day though and we were rushed so we didn't have the greatest experience, unfortunately. I'd love to go back and give it another shot. My favorite favorite place in Montreal though was Patisserie Kouign Ammann. Amaaaazing croissants. I've never tried Montreal bagels but I've heard so many good things about them! My favorite two things to eat when in Canada: Poutine and Croque-Monsieurs! I don't have any specific restaurant recommendations in Montreal, but if you ever go to Quebec City (which I recommend in and of itself! ), I can't say enough about the food at Pain Beni at the Auberge Place d'Armes (which is worth staying at as well). The prix fixe meal I ate there 7+ years ago stands out to this day as one of the best meals I ever ate! We love Montreal too! We told the border guard that we had bought a dozen St. Viateur bagels to take home and his quick response was: "so, how many of them do you have left?" uummm, not that many - my husband couldn't resist while they were warm. We were looking for poutine, and a woman who worked at a combat-zone type bar recommended a place - that was pretty awful. Still looking for great poutine everywhere, but we've learned that strippers maybe aren't the best food critics!